For a suburban destination, Glencarlyn Park in Arlington, Virginia is a nice one. The 96-acre park can be approached from multiple directions and boasts a dense network of hiking trails of varying difficulty. 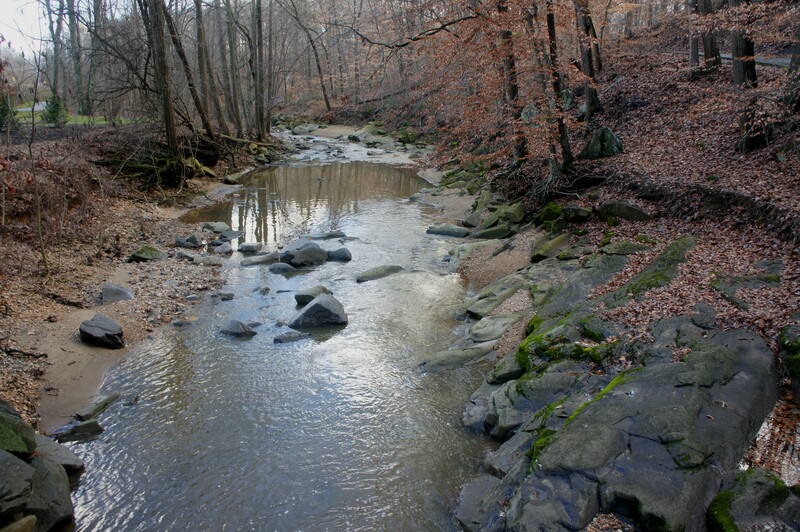 The focal point is a pleasant stream valley where the Long Branch stream meets Four Mile Run, the latter a relatively high-volume creek that stretches 9.4 miles from Falls Church, Virginia to the Potomac River. Because Glencarlyn Park is crisscrossed by a dizzying number of paved and unpaved trails—providing practically infinite permutations—describing any one route in detail is futile. (Note: For what’s it worth, my circuitous route in January 2016 is traced in the map below.) Instead, this post will focus on describing the park’s three sections: Long Branch, Glencarlyn Park proper, and the Glencarlyn Dog Park. 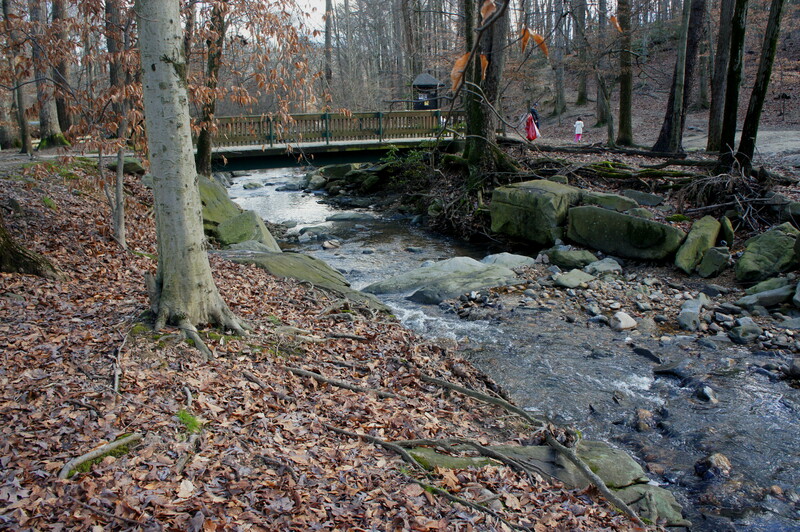 The Long Branch portion comprises roughly 1/3 mile of its namesake creek, ending at the confluence with Four Mile Run. The centerpiece of this area is the Long Branch Nature Center, reached by car from busy South Carlin Springs Road. (Note: The turnoff onto the narrow but paved road leading to the Nature Center is situated just south of the Virginia Hospital Center.) The Nature Center offers regular programs—even in the winter—geared mostly for children and the building serves as a starting point for several paths. To the north, an unpaved, ½-mile circuit climbs a hillside high above the Nature Center and drops back down through a minor ravine. 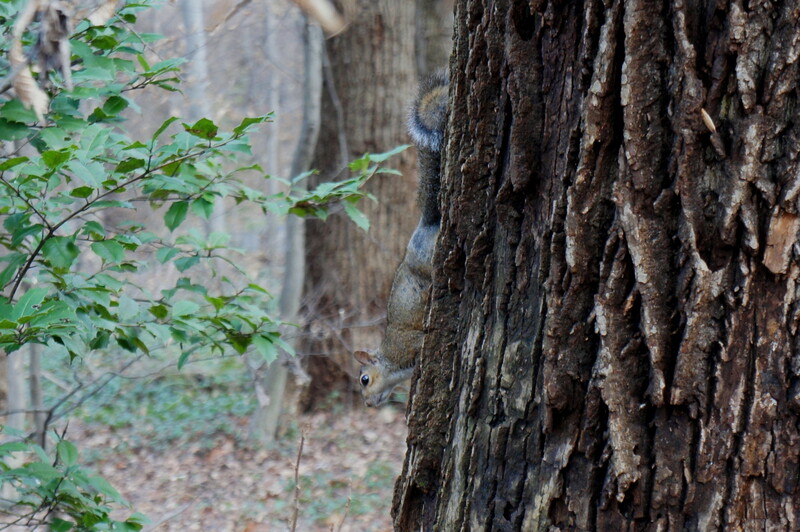 However, there is little excitement on this trail beyond trees and squirrels. A better alternative is the wide, paved path heading eastbound toward Four Mile Run. Here the trail follows—and crosses—scenic Long Branch, ending at a second narrow road, which in turn provides access to the Four Mile Run Trail and Washington & Old Dominion (W&OD) Trail and the dog park. 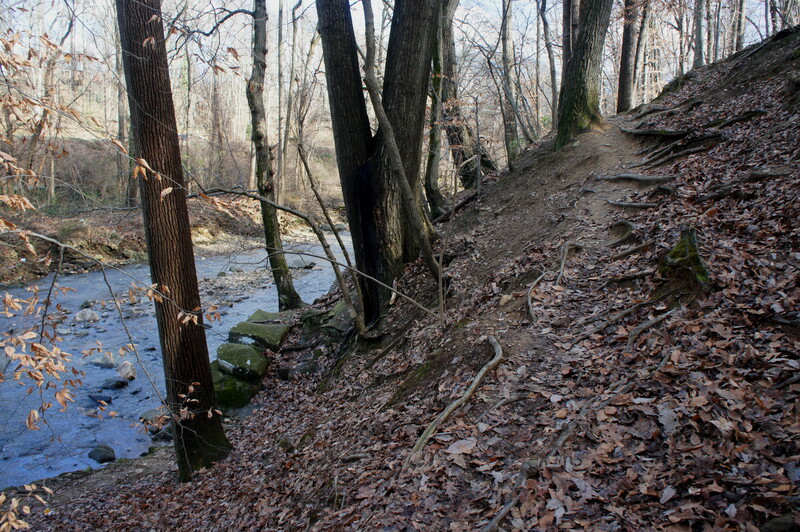 Along the south bank of Long Branch is the so-called “Rough Trail”—the subject of a subsequent post—aptly named for its many obstacles (trees, brush) and very faint path. 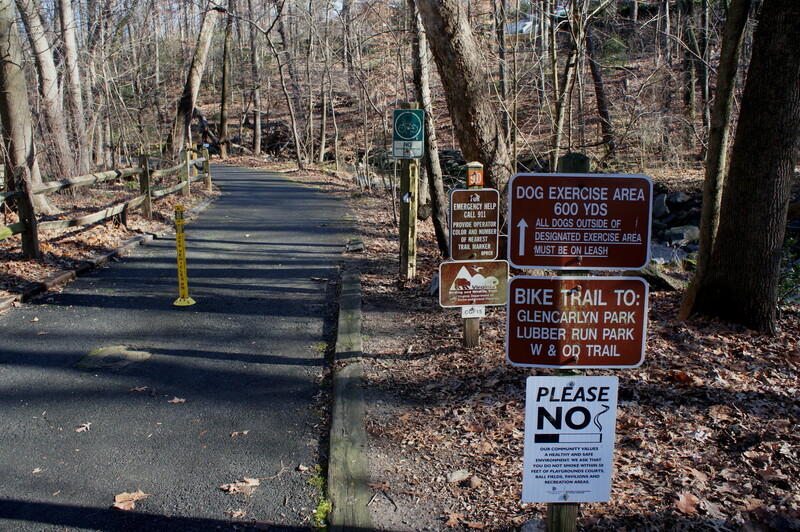 Glencarlyn Park technically stretches as far north as Arlington Boulevard and as far south as Columbia Pike, a distance of 1.1 miles on the Four Mile Run Trail. Its streamside center—chock full of picnic benches and a playground—serves as the heart of activity. The Four Mile Run Trail—and its straighter, wider cousin, the W&OD Trail—is a favorite for runners and cyclists and runs right past the playground. 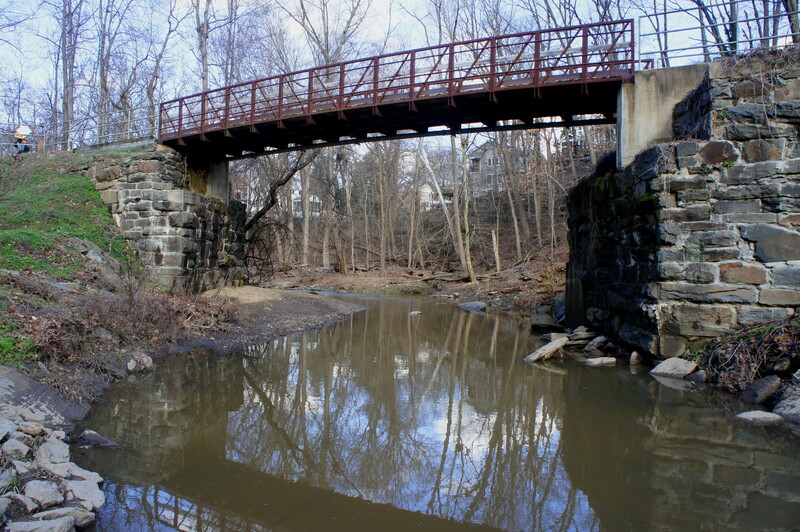 The W&OD Trail follows an old railroad grade and, at one point, crosses Four Mile Run to form a picturesque bridge, marred only by the sight of modern telephone lines rising high above. A series of unpaved, singletrack trails crisscross the western section of the park and afford greater solitude and nice views of the stream valley. Finally, the Glencarlyn Dog Park occupies a significant chunk of the park writ large and is situated just east of the Long Branch section. Here a set of predominantly unpaved—and modestly difficult—trails streak across the hillside; a few of the routes are noticeably more rugged than expected. Near the intersection of Four Mile Run and Long Branch, there is also a small dusty area for humans and canines to picnic and play. 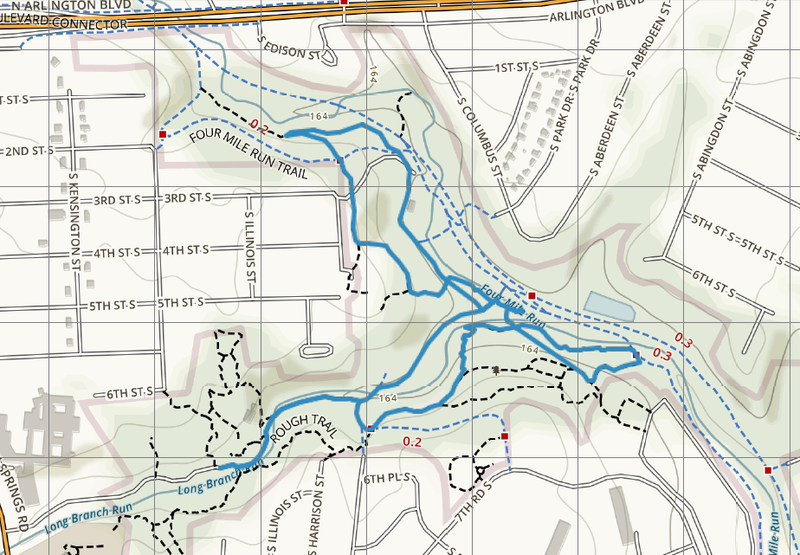 This entry was posted in Arlington County Parks, Easy Hikes, Virginia and tagged Arlington, Four Mile Run, Four Mile Run Trail, Glencarlyn Dog Park, Glencarlyn Park, Long Branch, Long Branch Nature Center, stream valley, Virginia, W&OD Trail, wheelchair-accessible. Bookmark the permalink. Great hike. I’m anxious to try it.